Make sure you always switch the camera OFF before switching to ON or TEST. Don’t switch directly from test to on or visa versa. Don’t try to force the card into the slot. With both models the contact side of the card is always towards the front of the camera. Card and slot can both be damaged by using force. Battery Cells are AA (LR6) size and can be Lithium, Alkaline or NiMH. Cells are easy to load and polarities are stamped on the metal contact plates inside the battery covers. If you insert a cell the wrong way round it will overheat, may catch fire and possibly stop the camera from working. When you first close the battery cover, the blue/red diode in the LED array will flash briefly although the camera is not switched on. This is normal. The power switch has three positions. Off is position one which is nearest the centre of the camera with both models. To switch the camera to test and access the setup menu, move the switch to the third position which is nearest the outside of the camera. 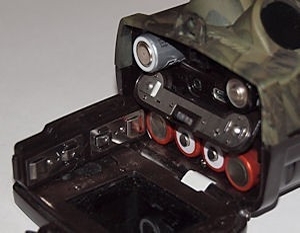 The middle position switches the camera on for normal operation. Switch the camera to the test position. When the camera fires up it will beep, flash the blue/red diode in the LED array and activate the information/monitor screen. Format the SD card in the camera (as instructed below) before you do anything else. Important: Do not format your SD card in Windows. 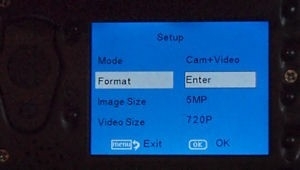 Format in the camera. To access the menu press the menu button once. On the 5210 it is the far left button and on the 6210 it is the top left button. The first page of the menu on both cameras is the same. Navigate to the second item down which is the format command. With it highlighted as in figures 8 and 9, press the OK button. The OK button is far right on the 5210 and bottom left on the 6210. When you press the OK button the screen will ask for confirmation. Navigate to YES and press OK. 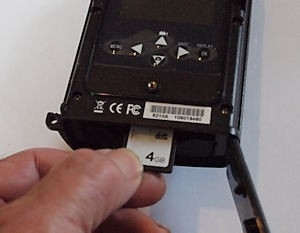 The screen will then ask you to wait and when the SD card is formatted, the camera will automatically exit the menu and return to the information screen. At this point the camera is ready to operate normally and is set to the manufacturer’s default settings. You can set your own personal settings later but first I would suggest you test the camera for correct function as follows. (14) (6210) times; after which you may hear a faint click as the IR filter moves across the lens. In daylight mode the IR filter is across the lens, while in night mode it moves away. If all is correct the camera will now be taking still images, every time (1 minute interval on default) the PIR is activated. Set the camera on a flat surface like a table top and walk about in front of the lens. Then move away behind the camera for a few minutes, before moving back in front of the lens. The result should be one or two images, then a time gap before one or two more. This tells you that the camera is firing when triggered but not when there is no trigger (trigger instability). You can check the images the camera has taken, by viewing them on the camera’s internal screen; but I find it a lot easier to turn the camera off, remove the card and stick it in the desk or lap top’s SD card slot. Open up Windows Explorer and viewing, and checking basic image data is straightforward. If you’ve followed the above exactly you will have confirmed that all the camera’s basic functions are working correctly before you get more deeply involved. The manual will walk you through all the menu options. There are however, some operational issues which can arise because of incorrect menu settings so I’ll go through those now. All 5210 and 6210 models before October 2012 have the same basic menu (excluding MMS menu) apart from the 6210 which has two additional items. These are Beep Sound on/off and SD Card Cycle on/off. The 5210 has four pages and the 6210 has five pages. Both menus are natural and easy to use but you must remember to press the OK button after each individual menu function change, otherwise the chosen function will revert to its original setting. When setting the Time Lapse or Timer to ON you must set times for both functions, otherwise the camera will fail to operate. If you think you’ve scrambled the menu settings, one option is to use the Default Set instruction which will return all settings apart from the clock, to the manufacturer’s default settings. You can then try entering your personalised settings again.